Yes, I am one of those moms. I put my baby in a pumpkin. My friend and I joked that it would become a “Pinterest Fail” but it actually turned out pretty darn awesome. Pick your pumpkin(s). Picking the right pumpkin is mucho important. There are two types of baby-in-pumpkin options, baby’s feet in or baby’s feet out. For feet in, it works easier if your baby is younger, like 0-3 months, and you obviously need to get a pumpkin big enough. I thought my pumpkin would be big enough for her feet in, but I didn’t realize how big she has gotten!! 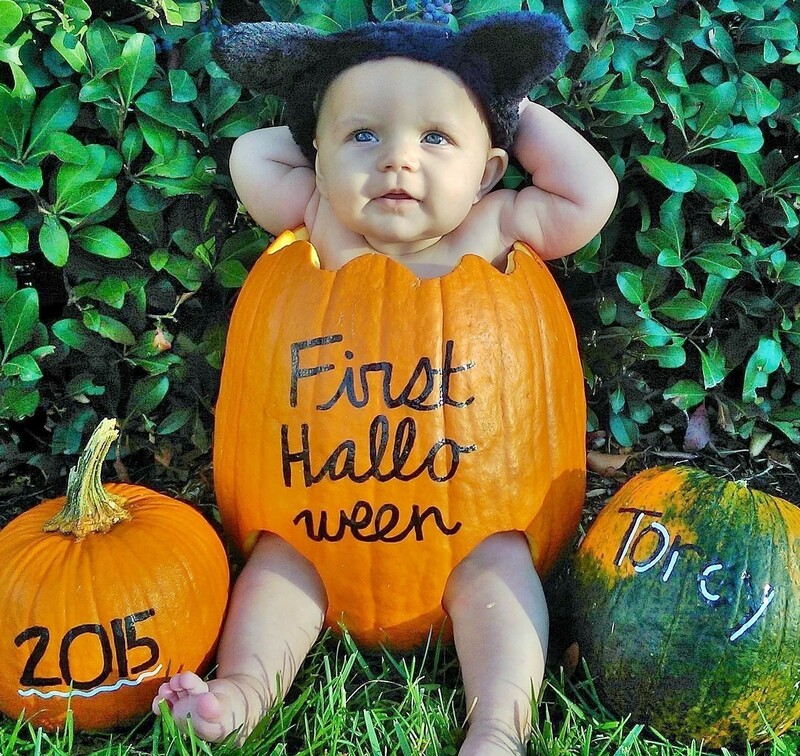 You want to make sure your pumpkin is tall enough to support your baby, but short enough to let your baby’s head/arms stick out. Generally, the younger your baby is, the more the pumpkin needs to support your baby so the snugger it needs to be. You have more wiggle room if your baby can sit up and support themselves. The easiest way is to have your baby sit next to the pumpkin when you are picking it out, but if you are lucky like me your baby slept for most of the pumpkin patch adventure so you have to guess. (I never thought I would write an entire paragraph on how to properly fit a baby into a pumpkin. Is this what my life has come to?) If you want some supporting pumpkins like I did, get preferably two of smaller size. Extra points for getting cute pumpkins (gourds or squash would work too!) of various colors and quirky shapes. Carve your pumpkin. 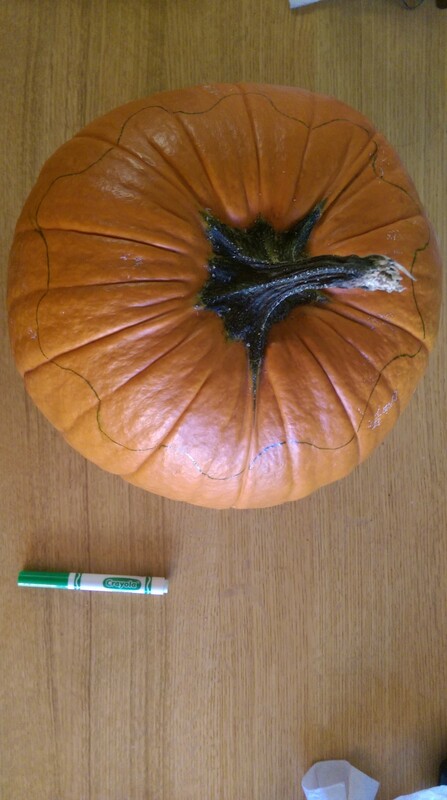 You need to know how tall your final pumpkin needs to be. If I could do it all over again, I would make the final pumpkin half an inch shorter (it is hard to tell in the above picture but the pumpkin was too tall for her to put her arms down). What I did was sit my baby on a table and then measure her from the table to where I want the pumpkin to sit on her, and then carve the top off your pumpkin to match. I wanted to make a cute swirly top to the pumpkin, so I drew a scalloped line around the top of the pumpkin in washable marker. The great thing about washable marker is I kept a damp paper towel next to me and when I messed up (like a billion times) it wipes right off. When I was happy with my swirl, I followed the line with my pumpkin carving knife to cut the top off. I then use d the pumpkin scraper in my kit to scrape the seeds and slime out of the pumpkin. 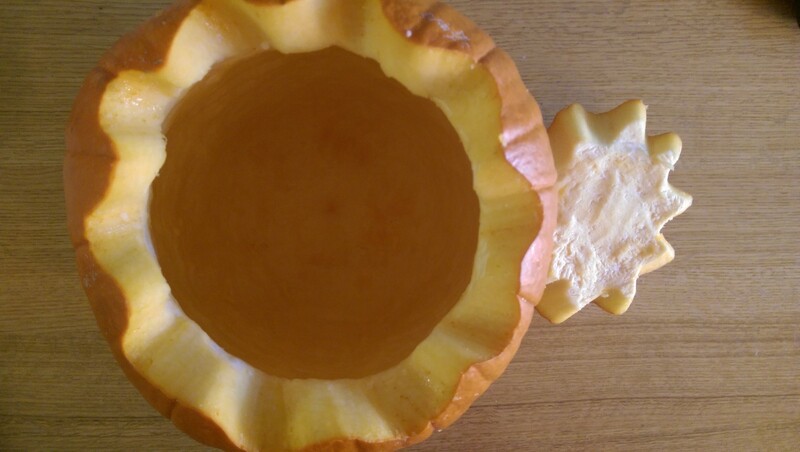 I really scraped down the inside of my pumpkin because I couldn’t get my daughter into it (I took the picture to the left before I did another round of scraping)!! If you are leaving feet in, you are done. If you are doing feet out, you need to cut leg holes for your babe. I used a can of carpet cleaner to trace the leg holes. Then I used the knife to cut the holes out. It is amazing how wide a baby’s legs naturally sit. I had her sit on the table, then measured how wide her legs sit, and then cut the holes that wide. 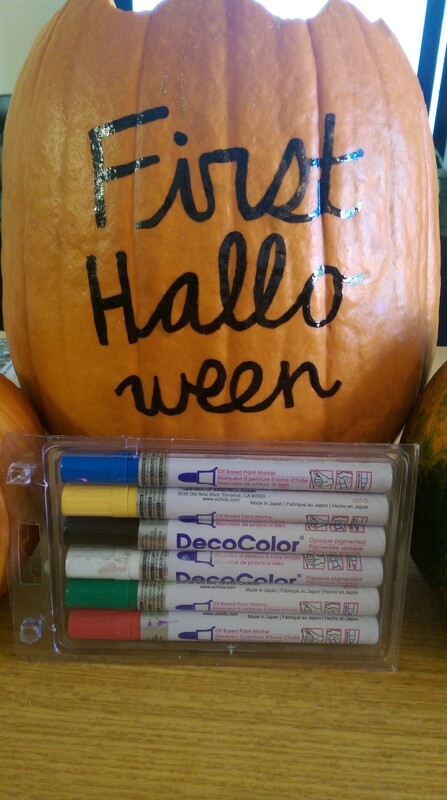 Write words on your pumpkin. First, wash and dry your pumpkin to get all the dirt and slime off. If you are more talented than me, you could easily carve or shave words into your pumpkin. I am too lazy and not talented enough for that, so I wrote words with black paint pen. First, I decided where the “front” of my pumpkin would be by turning my pumpkin and seeing where it is naturally the flattest and prettiest. Then I used the washable marker to draw a line down the center of the front of the pumpkin to make sure my words are centered. I then free-handed cursive writing with the washable marker, and “erasing” it with a damp paper towel when I made a mistake. When I liked the way it looked, I then traced over it with the paint pen, and then continued to make the line wider until it was to my satisfaction. Hint with the paint pen: to re-trace, make wider, or fix the letters, make sure the paint on the pumpkin is either still freshly wet or dry, if you try it when the paint was sticky half-dried it is really hard and makes a weird mess. If you have other supporting pumpkins, do the same with them. 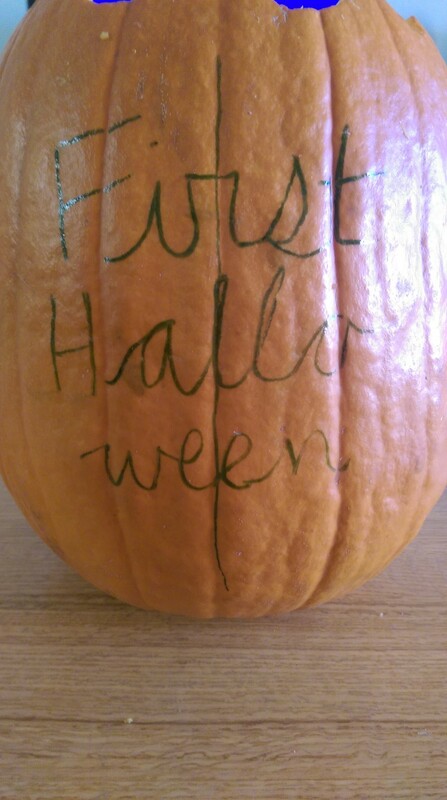 It was hard to read the writing on my half green pumpkin, so I made a cute detail with a white paint pen and then put a little on the other smaller pumpkin too. Take the picture. In order to get a good picture, you need to work some magic. First, take the picture when your child is naturally the happiest. Right after my daughter’s first feeding of the day is when she is naturally the calmest and happiest. Yes, that is at 7am! Second, you really need backup. I take most of my pictures solo, but this is one you really need help with. I needed help carting the pumpkins around the apartment complex, getting her in the pumpkin (it was a VERY tight fit), moving things and blocking lights and getting baby’s attention. My husband could tell if he didn’t help I would go all mommy-hormones on him, so he was a big help. Third, you need the right spot. You need to get a cute background and make sure the sun is in the right spot. The bush behind my daughter is only about an inch taller than her, and then behind her is a tennis court. But can you tell? No, thanks to some wonderful cropping. During our photo shoot the sun was rising literally as we were taking the picture, which made it difficult. Fourth, get everything set up BEFORE you put the baby in. Take test shots if you want to check lighting and angles. 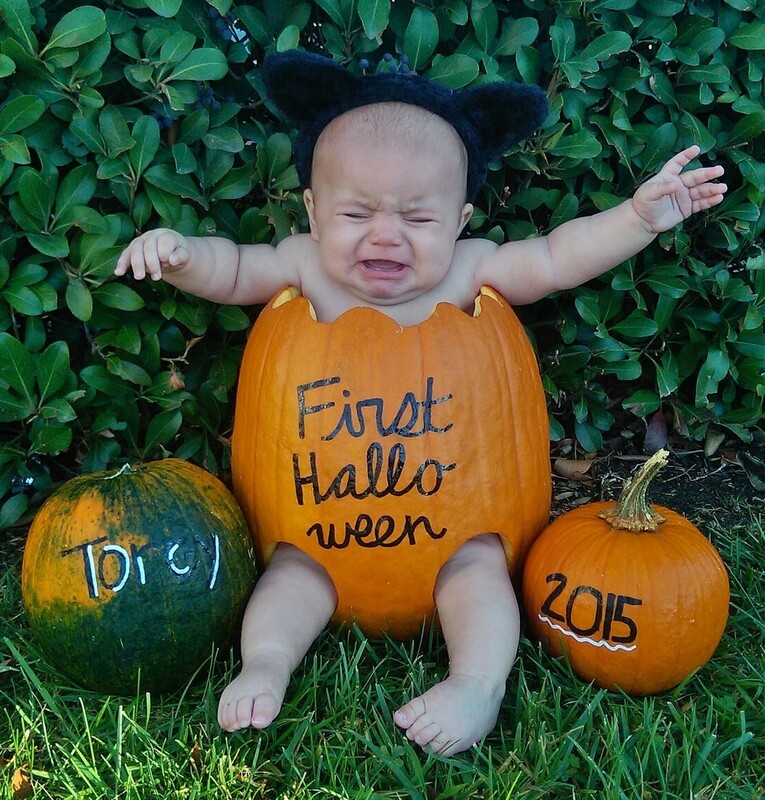 Trust me, your baby will not care that you couldn’t see the writing and have to re-take the picture. Fifth, once you get the baby in the pumpkin, you have between 5-60 seconds before the baby realizes what the heck you did to her and she screams bloody murder. Because of that, make sure everything is ready and the second you set your baby down start snapping! I must have taken a thousand pictures in a 60 second time frame, and only three were decent. Last, if the first photo shoot was a bust, that is ok! Put the pumpkins in the fridge and do it again later that day or the next day. Hint: I thought I would need to put a towel in the pumpkin to make it more comfortable, but I carved the pumpkin the day before and left it out on the counter and by the next morning it was almost completely dry so we put her straight in the pumpkin and she didn’t seem to mind! Once you get a good picture show it off! Even if you get a “Pinterest Fail” picture, show that off too because they are hilarious and just as cute! so cute! thanks for sharing. I am going to attempt this over the weekend.